There's a reason you've never seen anything like Hessel Studios' copper candlesticks. Gregg Hessel has kept his technique something of a secret over the years. This may have been unnecessary. In order to copy what he does, you'd have to master the technique. And before that, you'd need the tools - which you'd have to make. Their process is a combination of blacksmithing and silversmithing. Copper doesn't fire-stain like silver when it's heated, so they forge the copper hot with power hammers and finish hammer it cold. “Instead of just silversmithing we've added the blacksmithing techniques, on tubing rather than flat stock,” he explained. Since blacksmiths only need big hammers, there was nowhere to buy the smaller hammers suitable for copper. So they made their own power hammers ranging from three to 30 pounds. 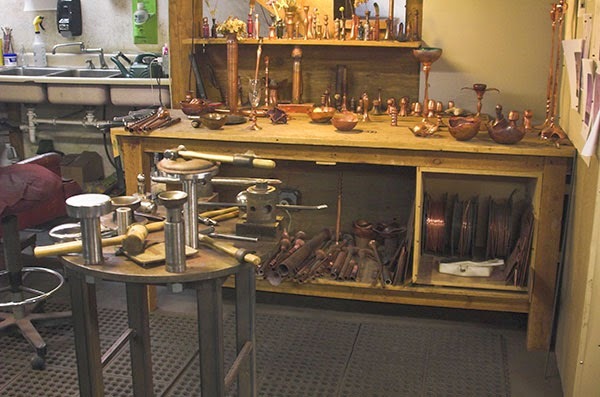 Gregg says they have over a hundred little hammers around the studio, as well as torches, anvils and a hundred year old foot press Gregg uses to finish the pieces off. While he's teaching one technique, he's been busy inventing another. And it's fascinating. In the meantime he's happy to be passing along his knowledge – not for people to copy their style, but so they can start working the technique.